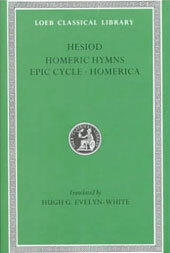 Loeb has now replaced this volume with three new translations, one containing the works Hesiod, another fragments of early Greek Epic and the third the Homeric Hymns and Homerica. These, as well as several other more recent translations and academic commentaries, appear in the booklist (left below). Come thou, let us begin with the Muses who gladden the great spirit of their father Zeus in Olympus with their songs, telling of things that are and that shall be and that were aforetime with consenting voice. Unwearying flows the sweet sound from their lips, and the house of their father Zeus the loud-thunderer is glad at the lily-like voice of the goddesses as it spread abroad, and the peaks of snowy Olympus resound, and the homes of the immortals. And they uttering their immortal voice, celebrate in song first of all the reverend race of the gods from the beginning, those whom Earth and wide Heaven begot, and the gods sprung of these, givers of good things. Then, next, the goddesses sing of Zeus, the father of gods and men, as they begin and end their strain, how much he is the most excellent among the gods and supreme in power. And again, they chant the race of men and strong giants, and gladden the heart of Zeus within Olympus, -- the Olympian Muses, daughters of Zeus the aegis-holder. Them in Pieria did Mnemosyne (Memory), who reigns over the hills of Eleuther, bear of union with the father, the son of Cronos, a forgetting of ills and a rest from sorrow. For nine nights did wise Zeus lie with her, entering her holy bed remote from the immortals. And when a year was passed and the seasons came round as the months waned, and many days were accomplished, she bare nine daughters, all of one mind, whose hearts are set upon song and their spirit free from care, a little way from the topmost peak of snowy Olympus. There are their bright dancing-places and beautiful homes, and beside them the Graces and Himerus (Desire) live in delight. And they, uttering through their lips a lovely voice, sing the laws of all and the goodly ways of the immortals, uttering their lovely voice. Then went they to Olympus, delighting in their sweet voice, with heavenly song, and the dark earth resounded about them as they chanted, and a lovely sound rose up beneath their feet as they went to their father. And he was reigning in heaven, himself holding the lightning and glowing thunderbolt, when he had overcome by might his father Cronos; and he distributed fairly to the immortals their portions and declared their privileges. These things, then, the Muses sang who dwell on Olympus, nine daughters begotten by great Zeus, Cleio and Euterpe, Thaleia, Melpomene and Terpsichore, and Erato and Polyhymnia and Urania and Calliope,3 who is the chiefest of them all, for she attends on worshipful princes: whomsoever of heaven-nourished princes the daughters of great Zeus honour, and behold him at his birth, they pour sweet dew upon his tongue, and from his lips flow gracious words. All the people look towards him while he settles causes with true judgements: and he, speaking surely, would soon make wise end even of a great quarrel; for therefore are there princes wise in heart, because when the people are being misguided in their assembly, they set right the matter again with ease, persuading them with gentle words. And when he passes through a gathering, they greet him as a god with gentle reverence, and he is conspicuous amongst the assembled: such is the holy gift of the Muses to men. For it is through the Muses and far-shooting Apollo that there are singers and harpers upon the earth; but princes are of Zeus, and happy is he whom the Muses love: sweet flows speech from his mouth. For though a man have sorrow and grief in his newly-troubled soul and live in dread because his heart is distressed, yet, when a singer, the servant of the Muses, chants the glorious deeds of men of old and the blessed gods who inhabit Olympus, at once he forgets his heaviness and remembers not his sorrows at all; but the gifts of the goddesses soon turn him away from these. Hail, children of Zeus! Grant lovely song and celebrate the holy race of the deathless gods who are for ever, those that were born of Earth and starry Heaven and gloomy Night and them that briny Sea did rear. Tell how at the first gods and earth came to be, and rivers, and the boundless sea with its raging swell, and the gleaming stars, and the wide heaven above, and the gods who were born of them, givers of good things, and how they divided their wealth, and how they shared their honours amongst them, and also how at the first they took many-folded Olympus. These things declare to me from the beginning, ye Muses who dwell in the house of Olympus, and tell me which of them first came to be. Verily at the first Chaos came to be, but next wide-bosomed Earth, the ever-sure foundations of all4 the deathless ones who hold the peaks of snowy Olympus, and dim Tartarus in the depth of the wide-pathed Earth, and Eros (Love), fairest among the deathless gods, who unnerves the limbs and overcomes the mind and wise counsels of all gods and all men within them. From Chaos came forth Erebus and black Night; but of Night were born Aether5 and Day, whom she conceived and bare from union in love with Erebus. And Earth first bare starry Heaven, equal to herself, to cover her on every side, and to be an ever-sure abiding-place for the blessed gods. And she brought forth long Hills, graceful haunts of the goddess-Nymphs who dwell amongst the glens of the hills. She bare also the fruitless deep with his raging swell, Pontus, without sweet union of love. But afterwards she lay with Heaven and bare deep-swirling Oceanus, Coeus and Crius and Hyperion and Iapetus, Theia and Rhea, Themis and Mnemosyne and gold-crowned Phoebe and lovely Tethys. After them was born Cronos the wily, youngest and most terrible of her children, and he hated his lusty sire. And again, she bare the Cyclopes, overbearing in spirit, Brontes, and Steropes and stubborn-hearted Arges,6 who gave Zeus the thunder and made the thunderbolt: in all else they were like the gods, but one eye only was set in the midst of their fore-heads. And they were surnamed Cyclopes (Orb-eyed) because one orbed eye was set in their foreheads. Strength and might and craft were in their works. And again, three other sons were born of Earth and Heaven, great and doughty beyond telling, Cottus and Briareos and Gyes, presumptuous children. From their shoulders sprang an hundred arms, not to be approached, and each had fifty heads upon his shoulders on their strong limbs, and irresistible was the stubborn strength that was in their great forms. For of all the children that were born of Earth and Heaven, these were the most terrible, and they were hated by their own father from the first. And he used to hide them all away in a secret place of Earth so soon as each was born, and would not suffer them to come up into the light: and Heaven rejoiced in his evil doing. But vast Earth groaned within, being straitened, and she made the element of grey flint and shaped a great sickle, and told her plan to her dear sons. And Heaven came, bringing on night and longing for love, and he lay about Earth spreading himself full upon her.7 Then the son from his ambush stretched forth his left hand and in his right took the great long sickle with jagged teeth, and swiftly lopped off his own father's members and cast them away to fall behind him. And not vainly did they fall from his hand; for all the bloody drops that gushed forth Earth received, and as the seasons moved round she bare the strong Erinyes and the great Giants with gleaming armour, holding long spears in their hands and the Nymphs whom they call Meliae8 all over the boundless earth. And so soon as he had cut off the members with flint and cast them from the land into the surging sea, they were swept away over the main a long time: and a white foam spread around them from the immortal flesh, and in it there grew a maiden. First she drew near holy Cythera, and from there, afterwards, she came to sea-girt Cyprus, and came forth an awful and lovely goddess, and grass grew up about her beneath her shapely feet. Her gods and men call Aphrodite, and the foam-born goddess and rich-crowned Cytherea, because she grew amid the foam, and Cytherea because she reached Cythera, and Cyprogenes because she was born in billowy Cyprus, and Philommedes9 because sprang from the members. And with her went Eros, and comely Desire followed her at her birth at the first and as she went into the assembly of the gods. This honour she has from the beginning, and this is the portion allotted to her amongst men and undying gods, -- the whisperings of maidens and smiles and deceits with sweet delight and love and graciousness. But these sons whom be begot himself great Heaven used to call Titans (Strainers) in reproach, for he said that they strained and did presumptuously a fearful deed, and that vengeance for it would come afterwards. And Night bare hateful Doom and black Fate and Death, and she bare Sleep and the tribe of Dreams. And again the goddess murky Night, though she lay with none, bare Blame and painful Woe, and the Hesperides who guard the rich, golden apples and the trees bearing fruit beyond glorious Ocean. Also she bare the Destinies and ruthless avenging Fates, Clotho and Lachesis and Atropos,10 who give men at their birth both evil and good to have, and they pursue the transgressions of men and of gods: and these goddesses never cease from their dread anger until they punish the sinner with a sore penalty. Also deadly Night bare Nemesis (Indignation) to afflict mortal men, and after her, Deceit and Friendship and hateful Age and hard-hearted Strife. But abhorred Strife bare painful Toil and Forgetfulness and Famine and tearful Sorrows, Fightings also, Battles, Murders, Manslaughters, Quarrels, Lying Words, Disputes, Lawlessness and Ruin, all of one nature, and Oath who most troubles men upon earth when anyone wilfully swears a false oath. And Sea begat Nereus, the eldest of his children, who is true and lies not: and men call him the Old Man because he is trusty and gentle and does not forget the laws of righteousness, but thinks just and kindly thoughts. And yet again he got great Thaumas and proud Phoreys, being mated with Earth, and fair-cheeked Ceto and Eurybia who has a heart of flint within her. And of Nereus and rich-haired Doris, daughter of Ocean the perfect river, were born children,11 passing lovely amongst goddesses, Ploto, Eucrante, Sao, and Amphitrite, and Eudora, and Thetis, Galene and Glauce, Cymothoe, Speo, Thoe and lovely Halie, and Pasithea, and Erato, and rosy-armed Eunice, and gracious Melite, and Eulimene, and Agaue, Doto, Proto, Pherusa, and Dynamene, and Nisaea, and Actaea, and Protomedea, Doris, Panopea, and comely Galatea, and lovely Hippothoe, and rosy-armed Hipponoe, and Cymodoce who with Cymatolege12 and Amphitrite easily calms the waves upon the misty sea and the blasts of raging winds, and Cymo, and Eione, and rich-crowned Alimede, and Glauconome, fond of laughter, and Pontoporea, Leagore, Euagore, and Laomedea, and Polynoe, and Autonoe, and Lysianassa, and Euarne, lovely of shape and without blemish of form, and Psamathe of charming figure and divine Menippe, Neso, Eupompe, Themisto, Pronoe, and Nemertes13 who has the nature of her deathless father. These fifty daughters sprang from blameless Nereus, skilled in excellent crafts. And Thaumas wedded Electra the daughter of deep-flowing Ocean, and she bare him swift Iris and the long-haired Harpies, Aello (Storm-swift) and Ocypetes (Swift-flier) who on their swift wings keep pace with the blasts of the winds and the birds; for quick as time they dart along. And again, Ceto bare to Phorcys the fair-cheeked Graiae, sisters grey from their birth: and both deathless gods and men who walk on earth call them Graiae, Pemphredo well-clad, and saffron-robed Enyo, and the Gorgons who dwell beyond glorious Ocean in the frontier land towards Night where are the clear-voiced Hesperides, Sthenno, and Euryale, and Medusa who suffered a woeful fate: she was mortal, but the two were undying and grew not old. With her lay the Dark-haired One14 in a soft meadow amid spring flowers. And when Perseus cut off her head, there sprang forth great Chrysaor and the horse Pegasus who is so called because he was born near the springs (pegae) of Ocean; and that other, because he held a golden blade (aor) in his hands. Now Pegasus flew away and left the earth, the mother of flocks, and came to the deathless gods: and he dwells in the house of Zeus and brings to wise Zeus the thunder and lightning. But Chrysaor was joined in love to Callirrhoe, the daughter of glorious Ocean, and begot three-headed Geryones. Him mighty Heracles slew in sea-girt Erythea by his shambling oxen on that day when he drove the wide-browed oxen to holy Tiryns, and had crossed the ford of Ocean and killed Orthus and Eurytion the herdsman in the dim stead out beyond glorious Ocean. And in a hollow cave she bare another monster, irresistible, in no wise like either to mortal men or to the undying gods, even the goddess fierce Echidna who is half a nymph with glancing eyes and fair cheeks, and half again a huge snake, great and awful, with speckled skin, eating raw flesh beneath the secret parts of the holy earth. And there she has a cave deep down under a hollow rock far from the deathless gods and mortal men. There, then, did the gods appoint her a glorious house to dwell in: and she keeps guard in Arima beneath the earth, grim Echidna, a nymph who dies not nor grows old all her days. Men say that Typhaon the terrible, outrageous and lawless, was joined in love to her, the maid with glancing eyes. So she conceived and brought forth fierce offspring; first she bare Orthus the hound of Geryones, and then again she bare a second, a monster not to be overcome and that may not be described, Cerberus who eats raw flesh, the brazen-voiced hound of Hades, fifty-headed, relentless and strong. And again she bore a third, the evil-minded Hydra of Lerna, whom the goddess, white-armed Hera nourished, being angry beyond measure with the mighty Heracles. And her Heracles, the son of Zeus, of the house of Amphitryon, together with warlike Iolaus, destroyed with the unpitying sword through the plans of Athene the spoil-driver. She was the mother of Chimaera who breathed raging fire, a creature fearful, great, swift-footed and strong, who had three heads, one of a grim-eyed lion; in her hinderpart, a dragon; and in her middle, a goat, breathing forth a fearful blast of blazing fire. Her did Pegasus and noble Bellerophon slay; but Echidna was subject in love to Orthus and brought forth the deadly Sphinx which destroyed the Cadmeans, and the Nemean lion, which Hera, the good wife of Zeus, brought up and made to haunt the hills of Nemea, a plague to men. There he preyed upon the tribes of her own people and had power over Tretus of Nemea and Apesas: yet the strength of stout Heracles overcame him. And Ceto was joined in love to Phorcys and bare her youngest, the awful snake who guards the apples all of gold in the secret places of the dark earth at its great bounds. This is the offspring of Ceto and Phorcys. And Tethys bare to Ocean eddying rivers, Nilus, and Alpheus, and deep-swirling Eridanus, Strymon, and Meander, and the fair stream of Ister, and Phasis, and Rhesus, and the silver eddies of Achelous, Nessus, and Rhodius, Haliacmon, and Heptaporus, Granicus, and Aesepus, and holy Simois, and Peneus, and Hermus, and Caicus fair stream, and great Sangarius, Ladon, Parthenius, Euenus, Ardescus, and divine Scamander. Also she brought forth a holy company of daughters15 who with the lord Apollo and the Rivers have youths in their keeping -- to this charge Zeus appointed them -- Peitho, and Admete, and Ianthe, and Electra, and Doris, and Prymno, and Urania divine in form, Hippo, Clymene, Rhodea, and Callirrhoe, Zeuxo and Clytie, and Idyia, and Pasithoe, Plexaura, and Galaxaura, and lovely Dione, Melobosis and Thoe and handsome Polydora, Cerceis lovely of form, and soft eyed Pluto, Perseis, Ianeira, Acaste, Xanthe, Petraea the fair, Menestho, and Europa, Metis, and Eurynome, and Telesto saffron-clad, Chryseis and Asia and charming Calypso, Eudora, and Tyche, Amphirho, and Ocyrrhoe, and Styx who is the chiefest of them all. These are the eldest daughters that sprang from Ocean and Tethys; but there are many besides. For there are three thousand neat-ankled daughters of Ocean who are dispersed far and wide, and in every place alike serve the earth and the deep waters, children who are glorious among goddesses. And as many other rivers are there, babbling as they flow, sons of Ocean, whom queenly Tethys bare, but their names it is hard for a mortal man to tell, but people know those by which they severally dwell. And Theia was subject in love to Hyperion and bare great Helius (Sun) and clear Selene (Moon) and Eos (Dawn) who shines upon all that are on earth and upon the deathless Gods who live in the wide heaven. And Eurybia, bright goddess, was joined in love to Crius and bare great Astraeus, and Pallas, and Perses who also was eminent among all men in wisdom. And Eos bare to Astraeus the strong-hearted winds, brightening Zephyrus, and Boreas, headlong in his course, and Notus, -- a goddess mating in love with a god. And after these Erigenia16 bare the star Eosphorus (Dawn-bringer), and the gleaming stars with which heaven is crowned. And Styx the daughter of Ocean was joined to Pallas and bare Zelus (Emulation) and trim-ankled Nike (Victory) in the house. Also she brought forth Cratos (Strength) and Bia (Force), wonderful children. These have no house apart from Zeus, nor any dwelling nor path except that wherein God leads them, but they dwell always with Zeus the loud-thunderer. For so did Styx the deathless daughter of Ocean plan on that day when the Olympian Lightener called all the deathless gods to great Olympus, and said that whosoever of the gods would fight with him against the Titans, he would not cast him out from his rights, but each should have the office which he had before amongst the deathless gods. And he declared that he who was without office and rights as is just. So deathless Styx came first to Olympus with her children through the wit of her dear father. And Zeus honoured her, and gave her very great gifts, for her he appointed to be the great oath of the gods, and her children to live with him always. And as he promised, so he performed fully unto them all. But he himself mightily reigns and rules. Again, Phoebe came to the desired embrace of Coeus. Then the goddess through the love of the god conceived and brought forth dark-gowned Leto, always mild, kind to men and to the deathless gods, mild from the beginning, gentlest in all Olympus. Also she bare Asteria of happy name, whom Perses once led to his great house to be called his dear wife. And she conceived and bare Hecate whom Zeus the son of Cronos honoured above all. He gave her splendid gifts, to have a share of the earth and the unfruitful sea. She received honour also in starry heaven, and is honoured exceedingly by the deathless gods. For to this day, whenever any one of men on earth offers rich sacrifices and prays for favour according to custom, he calls upon Hecate. Great honour comes full easily to him whose prayers the goddess receives favourably, and she bestows wealth upon him; for the power surely is with her. For as many as were born of Earth and Ocean amongst all these she has her due portion. The son of Cronos did her no wrong nor took anything away of all that was her portion among the former Titan gods: but she holds, as the division was at the first from the beginning, privilege both in earth, and in heaven, and in sea. Also, because she is an only child, the goddess receives not less honour, but much more still, for Zeus honours her. Whom she will she greatly aids and advances: she sits by worshipful kings in judgement, and in the assembly whom she will is distinguished among the people. And when men arm themselves for the battle that destroys men, then the goddess is at hand to give victory and grant glory readily to whom she will. Good is she also when men contend at the games, for there too the goddess is with them and profits them: and he who by might and strength gets the victory wins the rich prize easily with joy, and brings glory to his parents. And she is good to stand by horsemen, whom she will: and to those whose business is in the grey discomfortable sea, and who pray to Hecate and the loud-crashing Earth-Shaker, easily the glorious goddess gives great catch, and easily she takes it away as soon as seen, if so she will. She is good in the byre with Hermes to increase the stock. The droves of kine and wide herds of goats and flocks of fleecy sheep, if she will, she increases from a few, or makes many to be less. So, then. albeit her mother's only child,17 she is honoured amongst all the deathless gods. And the son of Cronos made her a nurse of the young who after that day saw with their eyes the light of all-seeing Dawn. So from the beginning she is a nurse of the young, and these are her honours. But Rhea was subject in love to Cronos and bare splendid children, Hestia,18 Demeter, and gold-shod Hera and strong Hades, pitiless in heart, who dwells under the earth, and the loud-crashing Earth-Shaker, and wise Zeus, father of gods and men, by whose thunder the wide earth is shaken. These great Cronos swallowed as each came forth from the womb to his mother's knees with this intent, that no other of the proud sons of Heaven should hold the kingly office amongst the deathless gods. For he learned from Earth and starry Heaven that he was destined to be overcome by his own son, strong though he was, through the contriving of great Zeus.19 Therefore he kept no blind outlook, but watched and swallowed down his children: and unceasing grief seized Rhea. But when she was about to bear Zeus, the father of gods and men, then she besought her own dear parents, Earth and starry Heaven, to devise some plan with her that the birth of her dear child might be concealed, and that retribution might overtake great, crafty Cronos for his own father and also for the children whom he had swallowed down. And they readily heard and obeyed their dear daughter, and told her all that was destined to happen touching Cronos the king and his stout-hearted son. So they sent her to Lyetus, to the rich land of Crete, when she was ready to bear great Zeus, the youngest of her children. Him did vast Earth receive from Rhea in wide Crete to nourish and to bring up. Thither came Earth carrying him swiftly through the black night to Lyctus first, and took him in her arms and hid him in a remote cave beneath the secret places of the holy earth on thick-wooded Mount Aegeum; but to the mightily ruling son of Heaven, the earlier king of the gods, she gave a great stone wrapped in swaddling clothes. Then he took it in his hands and thrust it down into his belly: wretch! he knew not in his heart that in place of the stone his son was left behind, unconquered and untroubled, and that he was soon to overcome him by force and might and drive him from his honours, himself to reign over the deathless gods. After that, the strength and glorious limbs of the prince increased quickly, and as the years rolled on, great Cronos the wily was beguiled by the deep suggestions of Earth, and brought up again his offspring, vanquished by the arts and might of his own son, and he vomited up first the stone which he had swallowed last. And Zeus set it fast in the wide-pathed earth at goodly Pytho under the glens of Parnassus, to be a sign thenceforth and a marvel to mortal men.20 And he set free from their deadly bonds the brothers of his father, sons of Heaven whom his father in his foolishness had bound. And they remembered to be grateful to him for his kindness, and gave him thunder and the glowing thunderbolt and lightening: for before that, huge Earth had hidden these. In them he trusts and rules over mortals and immortals. Now Iapetus took to wife the neat-ankled mad Clymene, daughter of Ocean, and went up with her into one bed. And she bare him a stout-hearted son, Atlas: also she bare very glorious Menoetius and clever Prometheus, full of various wiles, and scatter-brained Epimetheus who from the first was a mischief to men who eat bread; for it was he who first took of Zeus the woman, the maiden whom he had formed. But Menoetius was outrageous, and far-seeing Zeus struck him with a lurid thunderbolt and sent him down to Erebus because of his mad presumption and exceeding pride. And Atlas through hard constraint upholds the wide heaven with unwearying head and arms, standing at the borders of the earth before the clear-voiced Hesperides; for this lot wise Zeus assigned to him. And ready-witted Prometheus he bound with inextricable bonds, cruel chains, and drove a shaft through his middle, and set on him a long-winged eagle, which used to eat his immortal liver; but by night the liver grew as much again everyway as the long-winged bird devoured in the whole day. That bird Heracles, the valiant son of shapely-ankled Alcmene, slew; and delivered the son of Iapetus from the cruel plague, and released him from his affliction -- not without the will of Olympian Zeus who reigns on high, that the glory of Heracles the Theban-born might be yet greater than it was before over the plenteous earth. This, then, he regarded, and honoured his famous son; though he was angry, he ceased from the wrath which he had before because Prometheus matched himself in wit with the almighty son of Cronos. So said Zeus whose wisdom is everlasting, rebuking him. But wily Prometheus answered him, smiling softly and not forgetting his cunning trick: “Zeus, most glorious and greatest of the eternal gods, take which ever of these portions your heart within you bids." So he said, thinking trickery. But Zeus, whose wisdom is everlasting, saw and failed not to perceive the trick, and in his heart he thought mischief against mortal men which also was to be fulfilled. With both hands he took up the white fat and was angry at heart, and wrath came to his spirit when he saw the white ox-bones craftily tricked out: and because of this the tribes of men upon earth burn white bones to the deathless gods upon fragrant altars. So spake Zeus in anger, whose wisdom is everlasting; and from that time he was always mindful of the trick, and would not give the power of unwearying fire to the Melian21 race of mortal men who live on the earth. But the noble son of Iapetus outwitted him and stole the far-seen gleam of unwearying fire in a hollow fennel stalk. And Zeus who thunders on high was stung in spirit, and his dear heart was angered when he saw amongst men the far-seen ray of fire. Forthwith he made an evil thing for men as the price of fire; for the very famous Limping God formed of earth the likeness of a shy maiden as the son of Cronos willed. And the goddess bright-eyed Athene girded and clothed her with silvery raiment, and down from her head she spread with her hands a broidered veil, a wonder to see; and she, Pallas Athene, put about her head lovely garlands, flowers of new-grown herbs. Also she put upon her head a crown of gold which the very famous Limping God made himself and worked with his own hands as a favour to Zeus his father. On it was much curious work, wonderful to see; for of the many creatures which the land and sea rear up, he put most upon it, wonderful things, like living beings with voices: and great beauty shone out from it. But when he had made the beautiful evil to be the price for the blessing, he brought her out, delighting in the finery which the bright-eyed daughter of a mighty father had given her, to the place where the other gods and men were. And wonder took hold of the deathless gods and mortal men when they saw that which was sheer guile, not to be withstood by men. For from her is the race of women and female kind: of her is the deadly race and tribe of women who live amongst mortal men to their great trouble, no helpmeets in hateful poverty, but only in wealth. And as in thatched hives bees feed the drones whose nature is to do mischief -- by day and throughout the day until the sun goes down the bees are busy and lay the white combs, while the drones stay at home in the covered skeps and reap the toil of others into their own bellies – even so Zeus who thunders on high made women to be an evil to mortal men, with a nature to do evil. And he gave them a second evil to be the price for the good they had: whoever avoids marriage and the sorrows that women cause, and will not wed, reaches deadly old age without anyone to tend his years, and though he at least has no lack of livelihood while he lives, yet, when he is dead, his kinsfolk divide his possessions amongst them. And as for the man who chooses the lot of marriage and takes a good wife suited to his mind, evil continually contends with good; for whoever happens to have mischievous children, lives always with unceasing grief in his spirit and heart within him; and this evil cannot be healed. So it is not possible to deceive or go beyond the will of Zeus; for not even the son of Iapetus, kindly Prometheus, escaped his heavy anger, but of necessity strong bands confined him, although he knew many a wile. So he said: and the gods, givers of good things, applauded when they heard his word, and their spirit longed for war even more than before, and they all, both male and female, stirred up hated battle that day, the Titan gods, and all that were born of Cronos together with those dread, mighty ones of overwhelming strength whom Zeus brought up to the light from Erebus beneath the earth. An hundred arms sprang from the shoulders of all alike, and each had fifty heads growing upon his shoulders upon stout limbs. These, then, stood against the Titans in grim strife, holding huge rocks in their strong hands. And on the other part the Titans eagerly strengthened their ranks, and both sides at one time showed the work of their hands and their might. The boundless sea rang terribly around, and the earth crashed loudly: wide Heaven was shaken and groaned, and high Olympus reeled from its foundation under the charge of the undying gods, and a heavy quaking reached dim Tartarus and the deep sound of their feet in the fearful onset and of their hard missiles. So, then, they launched their grievous shafts upon one another, and the cry of both armies as they shouted reached to starry heaven; and they met together with a great battle-cry. Then Zeus no longer held back his might; but straight his heart was filled with fury and he showed forth all his strength. From Heaven and from Olympus he came forthwith, hurling his lightning: the bold flew thick and fast from his strong hand together with thunder and lightning, whirling an awesome flame. The life-giving earth crashed around in burning, and the vast wood crackled loud with fire all about. All the land seethed, and Ocean's streams and the unfruitful sea. The hot vapour lapped round the earthborn Titans: flame unspeakable rose to the bright upper air: the flashing glare of the thunder- stone and lightning blinded their eyes for all that there were strong. Astounding heat seized Chaos: and to see with eyes and to hear the sound with ears it seemed even as if Earth and wide Heaven above came together; for such a mighty crash would have arisen if Earth were being hurled to ruin, and Heaven from on high were hurling her down; so great a crash was there while the gods were meeting together in strife. Also the winds brought rumbling earthquake and duststorm, thunder and lightning and the lurid thunderbolt, which are the shafts of great Zeus, and carried the clangour and the warcry into the midst of the two hosts. An horrible uproar of terrible strife arose: mighty deeds were shown and the battle inclined. But until then, they kept at one another and fought continually in cruel war. And amongst the foremost Cottus and Briareos and Gyes insatiate for war raised fierce fighting: three hundred rocks, one upon another, they launched from their strong hands and overshadowed the Titans with their missiles, and buried them beneath the wide-pathed earth, and bound them in bitter chains when they had conquered them by their strength for all their great spirit, as far beneath the earth to Tartarus. For a brazen anvil falling down from heaven nine nights and days would reach the earth upon the tenth: and again, a brazen anvil falling from earth nine nights and days would reach Tartarus upon the tenth. Round it runs a fence of bronze, and night spreads in triple line all about it like a neck-circlet, while above grow the roots of the earth and unfruitful sea. There by the counsel of Zeus who drives the clouds the Titan gods are hidden under misty gloom, in a dank place where are the ends of the huge earth. And they may not go out; for Poseidon fixed gates of bronze upon it, and a wall runs all round it on every side. There Gyes and Cottus and great-souled Obriareus live, trusty warders of Zeus who holds the aegis. And there, all in their order, are the sources and ends of gloomy earth and misty Tartarus and the unfruitful sea and starry heaven, loathsome and dank, which even the gods abhor. It is a great gulf, and if once a man were within the gates, he would not reach the floor until a whole year had reached its end, but cruel blast upon blast would carry him this way and that. And this marvel is awful even to the deathless gods. There stands the awful home of murky Night wrapped in dark clouds. In front of it the son of Iapetus22 stands immovably upholding the wide heaven upon his head and unwearying hands, where Night and Day draw near and greet one another as they pass the great threshold of bronze: and while the one is about to go down into the house, the other comes out at the door. And the house never holds them both within; but always one is without the house passing over the earth, while the other stays at home and waits until the time for her journeying come; and the one holds all-seeing light for them on earth, but the other holds in her arms Sleep the brother of Death, even evil Night, wrapped in a vaporous cloud. There, in front, stand the echoing halls of the god of the lower-world, strong Hades, and of awful Persephone. A fearful hound guards the house in front, pitiless, and he has a cruel trick. On those who go in he fawns with his tail and both is ears, but suffers them not to go out back again, but keeps watch and devours whomsoever he catches going out of the gates of strong Hades and awful Persephone. And there dwells the goddess loathed by the deathless gods, terrible Styx, eldest daughter of back-flowing23 Ocean. She lives apart from the gods in her glorious house vaulted over with great rocks and propped up to heaven all round with silver pillars. Rarely does the daughter of Thaumas, swift- footed Iris, come to her with a message over the sea's wide back. But when strife and quarrel arise among the deathless gods, and when any of them who live in the house of Olympus lies, then Zeus sends Iris to bring in a golden jug the great oath of the gods from far away, the famous cold water which trickles down from a high and beetling rock. Far under the wide-pathed earth a branch of Oceanus flows through the dark night out of the holy stream, and a tenth part of his water is allotted to her. With nine silver-swirling streams he winds about the earth and the sea's wide back, and then falls into the main24; but the tenth flows out from a rock, a sore trouble to the gods. For whoever of the deathless gods that hold the peaks of snowy Olympus pours a libation of her water is forsworn, lies breathless until a full year is completed, and never comes near to taste ambrosia and nectar, but lies spiritless and voiceless on a strewn bed: and a heavy trance overshadows him. But when he has spent a long year in his sickness, another penance and an harder follows after the first. For nine years he is cut off from the eternal gods and never joins their councils of their feasts, nine full years. But in the tenth year he comes again to join the assemblies of the deathless gods who live in the house of Olympus. Such an oath, then, did the gods appoint the eternal and primaeval water of Styx to be: and it spouts through a rugged place. And there, all in their order, are the sources and ends of the dark earth and misty Tartarus and the unfruitful sea and starry heaven, loathsome and dank, which even the gods abhor. And there are shining gates and an immoveable threshold of bronze having unending roots and it is grown of itself.25 And beyond, away from all the gods, live the Titans, beyond gloomy Chaos. But the glorious allies of loud-crashing Zeus have their dwelling upon Ocean's foundations, even Cottus and Gyes; but Briareos, being goodly, the deep-roaring Earth-Shaker made his son-in-law, giving him Cymopolea his daughter to wed. But when Zeus had driven the Titans from heaven, huge Earth bare her youngest child Typhoeus of the love of Tartarus, by the aid of golden Aphrodite. Strength was with his hands in all that he did and the feet of the strong god were untiring. From his shoulders grew an hundred heads of a snake, a fearful dragon, with dark, flickering tongues, and from under the brows of his eyes in his marvellous heads flashed fire, and fire burned from his heads as he glared. And there were voices in all his dreadful heads which uttered every kind of sound unspeakable; for at one time they made sounds such that the gods understood, but at another, the noise of a bull bellowing aloud in proud ungovernable fury; and at another, the sound of a lion, relentless of heart; and at anothers, sounds like whelps, wonderful to hear; and again, at another, he would hiss, so that the high mountains re-echoed. And truly a thing past help would have happened on that day, and he would have come to reign over mortals and immortals, had not the father of men and gods been quick to perceive it. But he thundered hard and mightily: and the earth around resounded terribly and the wide heaven above, and the sea and Ocean's streams and the nether parts of the earth. Great Olympus reeled beneath the divine feet of the king as he arose and earth groaned thereat. And through the two of them heat took hold on the dark-blue sea, through the thunder and lightning, and through the fire from the monster, and the scorching winds and blazing thunderbolt. The whole earth seethed, and sky and sea: and the long waves raged along the beaches round and about, at the rush of the deathless gods: and there arose an endless shaking. Hades trembled where he rules over the dead below, and the Titans under Tartarus who live with Cronos, because of the unending clamour and the fearful strife. So when Zeus had raised up his might and seized his arms, thunder and lightning and lurid thunderbolt, he leaped form Olympus and struck him, and burned all the marvellous heads of the monster about him. But when Zeus had conquered him and lashed him with strokes, Typhoeus was hurled down, a maimed wreck, so that the huge earth groaned. And flame shot forth from the thunder- stricken lord in the dim rugged glens of the mount,26 when he was smitten. A great part of huge earth was scorched by the terrible vapour and melted as tin melts when heated by men's art in channelled27 crucibles; or as iron, which is hardest of all things, is softened by glowing fire in mountain glens and melts in the divine earth through the strength of Hephaestus.28 Even so, then, the earth melted in the glow of the blazing fire. And in the bitterness of his anger Zeus cast him into wide Tartarus. And from Typhoeus come boisterous winds which blow damply, except Notus and Boreas and clear Zephyr. These are a god-sent kind, and a great blessing to men; but the others blow fitfully upon the seas. Some rush upon the misty sea and work great havoc among men with their evil, raging blasts; for varying with the season they blow, scattering ships and destroying sailors. And men who meet these upon the sea have no help against the mischief. Others again over the boundless, flowering earth spoil the fair fields of men who dwell below, filling them with dust and cruel uproar. But when the blessed gods had finished their toil, and settled by force their struggle for honours with the Titans, they pressed far-seeing Olympian Zeus to reign and to rule over them, by Earth's prompting. So he divided their dignities amongst them. craftily deceived her with cunning words and put her in his own belly, as Earth and starry Heaven advised. For they advised him so, to the end that no other should hold royal sway over the eternal gods in place of Zeus; for very wise children were destined to be born of her, first the maiden bright-eyed Tritogeneia, equal to her father in strength and in wise understanding; but afterwards she was to bear a son of overbearing spirit, king of gods and men. But Zeus put her into his own belly first, that the goddess might devise for him both good and evil. Next he married bright Themis who bare the Horae (Hours), and Eunomia (Order), Dike (Justice), and blooming Eirene (Peace), who mind the works of mortal men, and the Moerae (Fates) to whom wise Zeus gave the greatest honour, Clotho, and Lachesis, and Atropos who give mortal men evil and good to have. And Eurynome, the daughter of Ocean, beautiful in form, bare him three fair-cheeked Charites (Graces), Aglaea, and Euphrosyne, and lovely Thaleia, from whose eyes as they glanced flowed love that unnerves the limbs: and beautiful is their glance beneath their brows. Also he came to the bed of all-nourishing Demeter, and she bare white-armed Persephone whom Aidoneus carried off from her mother; but wise Zeus gave her to him. And again, he loved Mnemosyne with the beautiful hair: and of her the nine gold-crowned Muses were born who delight in feasts and the pleasures of song. And Leto was joined in love with Zeus who holds the aegis, and bare Apollo and Artemis delighting in arrows, children lovely above all the sons of Heaven. Lastly, he made Hera his blooming wife: and she was joined in love with the king of gods and men, and brought forth Hebe and Ares and Eileithyia. But Zeus himself gave birth from his own head to bright-eyed Tritogeneia,29 the awful, the strife-stirring, the host-leader, the unwearying, the queen, who delights in tumults and wars and battles. But Hera without union with Zeus -- for she was very angry and quarrelled with her mate -- bare famous Hephaestus, who is skilled in crafts more than all the sons of Heaven. [929a]30 But Hera was very angry and quarrelled with her mate. And because of this strife she bare without union with Zeus who holds the aegis a glorious son, Hephaestus, who excelled all the sons of Heaven in crafts. But Zeus lay with the fair- cheeked daughter of Ocean and Tethys apart from Hera . . . ((lacuna)) deceiving Metis (Thought) although she was full wise. But he seized her with his hands and put her in his belly, for fear that she might bring forth something stronger than his thunderbolt: therefore did Zeus, who sits on high and dwells in the aether, swallow her down suddenly. But she straightway conceived Pallas Athene: and the father of men and gods gave her birth by way of his head on the banks of the river Trito. And she remained hidden beneath the inward parts of Zeus, even Metis, Athena's mother, worker of righteousness, who was wiser than gods and mortal men. There the goddess (Athena) received that31 whereby she excelled in strength all the deathless ones who dwell in Olympus, she who made the host-scaring weapon of Athena. And with it (Zeus) gave her birth, arrayed in arms of war. And of Amphitrite and the loud-roaring Earth-Shaker was born great, wide-ruling Triton, and he owns the depths of the sea, living with his dear mother and the lord his father in their golden house, an awful god. Also Cytherea bare to Ares the shield-piercer Panic and Fear, terrible gods who drive in disorder the close ranks of men in numbing war, with the help of Ares, sacker of towns: and Harmonia whom high-spirited Cadmus made his wife. And Maia, the daughter of Atlas, bare to Zeus glorious Hermes, the herald of the deathless gods, for she went up into his holy bed. And Semele, daughter of Cadmus was joined with him in love and bare him a splendid son, joyous Dionysus, -- a mortal woman an immortal son. And now they both are gods. And Alemena was joined in love with Zeus who drives the clouds and bare mighty Heracles. And golden-haired Dionysus made brown-haired Ariadne, the daughter of Minos, his buxom wife: and the son of Cronos made her deathless and unageing for him. And mighty Heracles, the valiant son of neat-ankled Alcmena, when he had finished his grievous toils, made Hebe the child of great Zeus and gold-shod Hera his shy wife in snowy Olympus. Happy he! For he has finished his great works and lives amongst the dying gods, untroubled and unaging all his days. And Perseis, the daughter of Ocean, bare to unwearying Helios Circe and Aeetes the king. And Aeetes, the son of Helios who shows light to men, took to wife fair-cheeked Idyia, daughter of Ocean the perfect stream, by the will of the gods: and she was subject to him in love through golden Aphrodite and bare him neat-ankled Medea. And now farewell, you dwellers on Olympus and you islands and continents and thou briny sea within. Now sing the company of goddesses, sweet-voiced Muses of Olympus, daughter of Zeus who holds the aegis, -- even those deathless one who lay with mortal men and bare children like unto gods. Demeter, bright goddess, was joined in sweet love with the hero Iasion in a thrice-ploughed fallow in the rich land of Crete, and bare Plutus, a kindly god who goes everywhere over land and the sea's wide back, and him who finds him and into whose hands he comes he makes rich, bestowing great wealth upon him. And Harmonia, the daughter of golden Aphrodite, bare to Cadmus Ino and Semele and fair-cheeked Agave and Autonoe whom long haired Aristaeus wedded, and Polydorus also in rich-crowned Thebe. And the daughter of Ocean, Callirrhoe was joined in the love of rich Aphrodite with stout hearted Chrysaor and bare a son who was the strongest of all men, Geryones, whom mighty Heracles killed in sea-girt Erythea for the sake of his shambling oxen. And Eos bare to Tithonus brazen-crested Memnon, king of the Ethiopians, and the Lord Emathion. And to Cephalus she bare a splendid son, strong Phaethon, a man like the gods, whom, when he was a young boy in the tender flower of glorious youth with childish thoughts, laughter-loving Aphrodite seized and caught up and made a keeper of her shrine by night, a divine spirit. And [Jason] the son of Aeson by the will of the gods led away from Aeetes, [Medea] the daughter of Aeetes the heaven-nurtured king, when he had finished the many grievous labours which the great king, over bearing Pelias, that outrageous and presumptuous doer of violence, put upon him. But when the son of Aeson had finished them, he came to Iolcus after long toil bringing the coy-eyed girl with him on his swift ship, and made her his buxom wife. And she was subject to Iason, shepherd of the people, and bare a son Medeus whom Cheiron the son of Philyra brought up in the mountains. And the will of great Zeus was fulfilled. But of the daughters of Nereus, the Old man of the Sea, Psamathe the fair goddess, was loved by Aeacus through golden Aphrodite and bare Phocus. And the silver-shod goddess Thetis was subject to Peleus and brought forth lion-hearted Achilles, the destroyer of men. And Cytherea with the beautiful crown was joined in sweet love with the hero Anchises and bare Aeneas on the peaks of Ida with its many wooded glens. And Circe the daughter of Helius, Hyperion's son, loved steadfast Odysseus and bare Agrius and Latinus who was faultless and strong: also she brought forth Telegonus by the will of golden Aphrodite. And they ruled over the famous Tyrenians, very far off in a recess of the holy islands. And the bright goddess Calypso was joined to Odysseus in sweet love, and bare him Nausithous and Nausinous. These are the immortal goddesses who lay with mortal men and bare them children like unto gods. But now, sweet-voiced Muses of Olympus, daughters of Zeus who holds the aegis, sing of the company of women. 1. The epithet probably indicates coquettishness. 2. A proverbial saying meaning, "why enlarge on irrelevant topics?" 3. "She of the noble voice": Calliope is queen of Epic poetry. 4. Earth, in the cosmology of Hesiod, is a disk surrounded by the river Oceanus and floating upon a waste of waters. It is called the foundation of all (the qualification "the deathless ones ..." etc. is an interpolation), because not only trees, men, and animals, but even the hills and seas (ll. 129, 131) are supported by it. 5. Aether is the bright, untainted upper atmosphere, as distinguished from Aer, the lower atmosphere of the earth. 6. Brontes is the Thunderer; Steropes, the Lightener; and Arges, the Vivid One. 7. The myth accounts for the separation of Heaven and Earth. In Egyptian cosmology Nut (the Sky) is thrust and held apart from her brother Geb (the Earth) by their father Shu, who corresponds to the Greek Atlas. 8. Nymphs of the ash-trees, as Dryads are nymphs of the oak-trees. Cp. note on Works and Days, l. 145. 9. "Member-loving": the title is perhaps only a perversion of the regular Philomeides (laughter-loving). 10. Cletho (the Spinner) is she who spins the thread of man's life; Lachesis (the Disposer of Lots) assigns to each man his destiny; Atropos (She who cannot be turned) is the "Fury with the abhorred shears." 11. Many of the names which follow express various qualities or aspects of the sea: thus Galene is "Calm", Cymothoe is the "Wave-swift", Pherusa and Dynamene are "She who speeds (ships)" and "She who has power." 12. The "Wave-receiver" and the "Wave-stiller." 13. "The Unerring" or "Truthful"; cp. l. 235. 15. Goettling notes that some of these nymphs derive their names from lands over which they preside, as Europa, Asia, Doris, Ianeira ("Lady of the Ionians"), but that most are called after some quality which their streams possessed: thus Xanthe is the "Brown" or "Turbid," Amphirho is the "Surrounding" river, Ianthe is "She who delights," and Ocyrrhoe is the "Swift-flowing." 16. i.e. Eos, the "Early-born." 17. Van Lennep explains that Hecate, having no brothers to support her claim, might have been slighted. 18. The goddess of the hearth (the Roman "Vesta"), and so of the house. Cp. Homeric Hymns v.22 ff. ; xxxix.1 ff. 19. The variant reading "of his father" (sc. Heaven) rests on inferior MS. authority and is probably an alteration due to the difficulty stated by a Scholiast: "How could Zeus, being not yet begotten, plot against his father?" The phrase is, however, part of the prophecy. The whole line may well be spurious, and is rejected by Heyne, Wolf, Gaisford and Guyet. 20. Pausanias (x. 24.6) saw near the tomb of Neoptolemus "a stone of no great size," which the Delphians anointed every day with oil, and which he says was supposed to be the stone given to Cronos. 21. A Scholiast explains: "Either because they (men) sprang from the Melian nymphs (cp. l. 187); or because, when they were born (? ), they cast themselves under the ash-trees, that is, the trees." The reference may be to the origin of men from ash-trees: cp. Works and Days, l. 145 and note. 22. sc. Atlas, the Shu of Egyptian mythology: cp. note on line 177. 23. Oceanus is here regarded as a continuous stream enclosing the earth and the seas, and so as flowing back upon himself. 24. The conception of Oceanus is here different: he has nine streams which encircle the earth and the flow out into the "main" which appears to be the waste of waters on which, according to early Greek and Hebrew cosmology, the disk-like earth floated. 25. i.e. the threshold is of "native" metal, and not artificial. 26. According to Homer Typhoeus was overwhelmed by Zeus amongst the Arimi in Cilicia. Pindar represents him as buried under Aetna, and Tzetzes reads Aetna in this passage. 27. The epithet (which means literally "well-bored") seems to refer to the spout of the crucible. 28. The fire god. There is no reference to volcanic action: iron was smelted on Mount Ida; cp. Epigrams of Homer, ix. 2-4. 30. Restored by Peppmuller. The nineteen following lines from another recension of lines 889-900, 924-9 are quoted by Chrysippus (in Galen). 31. sc. the aegis. Line 929s is probably spurious, since it disagrees with l. 929q and contains a suspicious reference to Athens.